One of the joys of owning an android is the ability to customize your device, changing just about anything that you are not pleased with inclusng the keyboard. One of my gripes is with the default keyboard (don't get me wrong the stock keyboard is very capable particularly if you have got a device running ice cream sandwich or jellybean), is that it fails to fulfill some of my needs like text substitution or auto text expansion. I have tried a couple of alternative keyboard apps such as Swiftkey X, Thumb keyboard, Go keyboard, Smart keyboard Pro, Touchpad keyboard, Kii keyboard, Adaptxt and some keyboard apps that I cant even remember any more. Of the lot, five keyboard apps stand out to me as they offer two features that I really need such as text expansion and next word prediction. With Swiftkey X I had an excellent next word prediction engine that scanned my SMS, tweets and facebook posts to learn how I typed and offer word suggestions thereby saving me extra key presses. But there isn't any text expansion or text substitution, which I found useful for birthday posts on facebook and tweets. Thumb Keyboard and Smart Keyboard Pro are two of a kind as they both offer text expansion but no good next word prediction as the prediction engine only suggests a word after you have typed a few letters. And these two apps come with a steep price to pay. 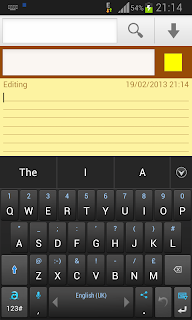 Smart Keyboard Pro and Thumb Keyboard are easily customized with themes. Kii Keyboard is a free keyboard app currently in it's beta stage, Kii keyboard tries to mimic the next word prediction feature of the Swiftkey keyboard but fails as it doesn't not really learn how you type like Swiftkey does, which makes the next word suggestions rather useless. But that does little to diminish my love for this app. The excellent text expansion, easy text correction and ability to be customized with themes from Go Keyboard makes this a good app to have installed. You can also use emoji and special characters with this keyboard. Adaptxt keyboard is currently my keyboard of choice, Symbian users would remember this app, it not only offers me the ability to use autotext shortcuts but also the next word prediction is rather good and is almost as good as the Swiftkey X. And best of all it is free, and can be customized by downloading add-on such as language dictionaries, medical, business and SMS dictionaries which makes typing easier and quicker.